Is Scrum Project Management Methodology A Fit for My Team? You've probably heard of all kinds of project management methodologies—Scrum, Waterfall, Kanban, Agile—but which of these methodologies is the right fit for your team? This post will walk you through the basics of the Scrum project management methodology to see if it's a fit, and will provide you with some free resources to help you get started. Scrum project management methodology is a structure used for organizing and managing the moving parts of a project. Originally designed for use in software development, Scrum is now used by organizations and project managers across all disciplines. In addition to empowering teams to think creatively as they iterate, Scrum drives feature prioritization by organizing features and goals into deliverables that the team works on in two-week sprints. This ensures that the most important work gets done first. The term Scrum is borrowed from rugby, where a Scrum is the huddle the team forms on the field during the game to call plays and make strategic decisions. Scrum can be used by anyone who needs to produce an end product, such as a webpage, a software program, or even a construction project. Now that you have visual overview of Scrum, let’s take a closer look at Scrum roles and the Scrum process to see if this project management methodology is a fit for you. 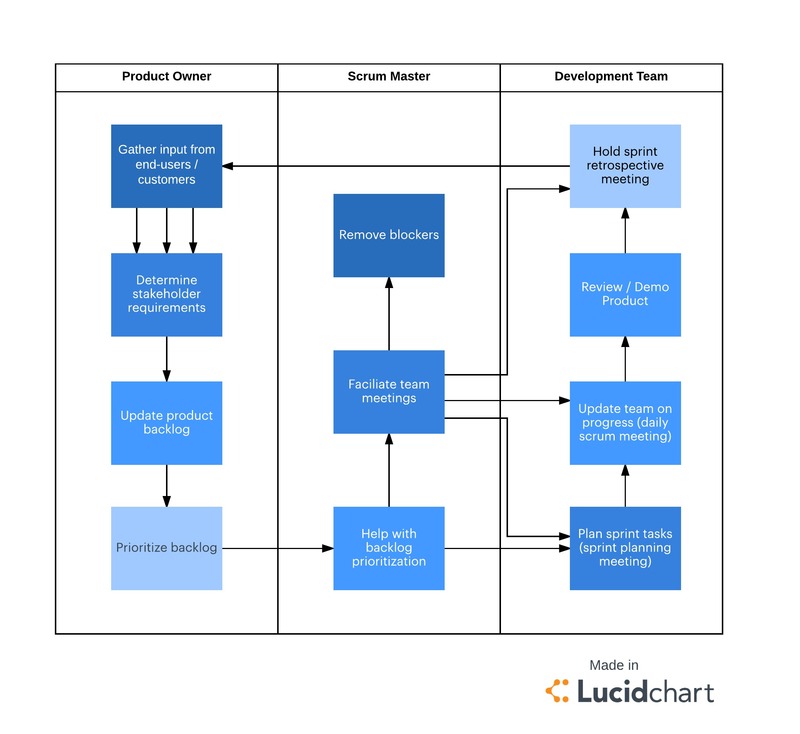 To start using the Scrum methodology, there are a few key roles that need to be assigned: the product owner, the Scrum master, and the development team. The product owner is a stand-in for the customer and should keep the best interest of the stakeholders in mind while working through sprints and prioritizing the backlog. The role of the product owner is to guide the team and encourage open communication across all positions. A successful product owner is organized and available to answer questions and provide clarity throughout the life cycle of the project. The Scrum master removes roadblocks and facilitates handoffs where needed to keep the sprint running smoothly. A key difference between a Scrum master and a traditional project manager is that a Scrum master does not give step-by-step direction to the team. At the beginning of a project, the Scrum master and product owner meet to prioritize features and organize the sprint. The rest of the participants in a Scrum are members of the development team who are tasked with executing the product deliverables. Anyone who has a hand in creating the product is on the development team, including programmers, designers, writers, and platform-testers (also known as Quality Assurance (QA) experts). In Scrum, the development team is self-led, and every member works together to complete each sprint. The development team must decide amongst themselves how to best accomplish the deliverables. Once roles have been identified and staffed, the product owner and the Scrum master will host a series of planning meetings to identify the features of the project. During each two-week sprint, the Scrum process includes these three activities so the team has checkpoints to communicate. What features can we deliver in this sprint? How will we work to achieve these deliverables? You can plan for the sprint using a Scrum software or the old-fashioned pen-and-paper approach, but you may want your plan to exist as a living document to be updated as needed. 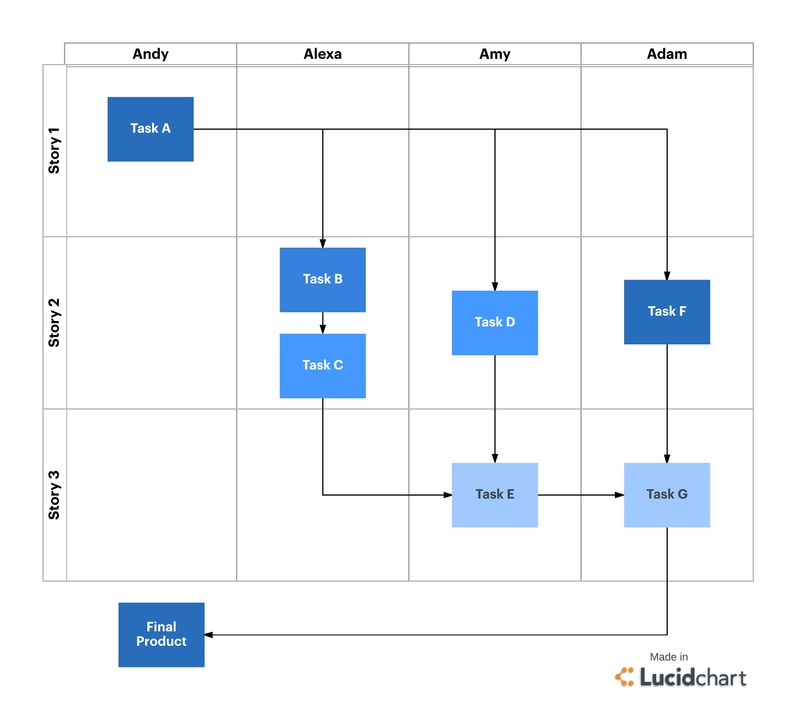 Using Lucidchart, you can easily map out and visualize the tasks you plan on completing, and you can use swimlanes to assign owners for each task. Your whole team can edit and collaborate in real time as you create this plan. If you need some inspiration, learn how DocuSign used Lucidchart to transform their sprint planning process. A daily Scrum meeting is held to talk about the previous day’s work, discuss hang-ups, and define what work will be completed that day. Each member of the team updates the group on what they’ve been working on and brings up any issues or questions. Ideally, a daily Scrum meeting should not exceed 15 minutes. A sprint typically lasts about two weeks, at the end of which the team meets to review progress and processes. In order to optimize the next sprint, team members gather feedback on features and their functionality. During this sprint review, any necessary changes are implemented. Communication must take center stage throughout the planning and review processes, as the Scrum method relies on transparency across the team to function properly. If and when barriers arise, team members should be ready to adjust their course and prioritize goals as needed. As each iteration of the product is completed and feedback is gathered, the project roadmap is subject to change. Now that you have the players and process in place, let’s look at the important scrum elements that contribute to this iterative process. Throughout the lifespan of a project, the product owner will manage the product backlog. The product backlog is where all the features of a product are listed and prioritized. The product owner is solely responsible for any changes to the organization and prioritization. Within a specific sprint, the sprint backlog lists all the tasks to be completed. Tasks are pulled from the product backlog, prioritized in the sprint, and assigned to the development team for completion during the sprint. It is up to the development team to work together to decide how best to complete the tasks at hand. Burndown charts are a visual representation of work still remaining in a sprint and should give team members an at-a-glance update on the progress of the sprint. A burndown chart can be created with a few Post-it notes on a blank wall, an Excel document, a Google Sheet, or housed in Scrum project management software. Above all else, Scrum is about a handful of people working together efficiently to deliver iterative work. To most effectively utilize the Scrum methodology, team members must be available for communication and collaboration throughout the sprint. Team members should also be willing to take on different roles as needed to deliver a working product and meet sprint goals. As a result, individuals who work remotely may find it challenging to participate fully in the process. When you document your processes in Lucidchart, you can integrate with all of your favorite workplace apps and add diagrams to a Google doc, Confluence page, JIRA issue, and more. This makes it easier to keep teams on the same page no matter where you work. Scrum was designed to be scalable, so a team may find that conducting a daily Scrum over video chat works the best for them. So is Scrum the the best methodology for you? The answer is usually "it depends". To explore other project management methodologies, check out Agile project management, or our article on how you may already be using the Waterfall methodology to find the best fit for your projects and your team.